In today’s business environment it is essential for companies to keep tight control of their IT spend to ensure that it is optimized to avoid costs so the spend can be allocated to new technological investments. IT decision makers need to be aware of the IT assets that are operating within their networks so they don’t risk overspending. Many C-level executives are well aware of this need. However, with the abundance of solutions now readily available on the market that address specific problems, but not the entire asset lifecycle, organizations are searching for scalable solutions and providers to solve a multitude of needs in the IT infrastructure. If you have been considering the implementation of IT Lifecycle Management into your company, you understand the need to account for every resource within your environment, including operating systems, hardware, middleware, and applications, including dependencies between resources. Necessary factors for success; a business process and owner assigned for each resource, a schedule for reviews and updates based on criticality, and a calendar of expiration dates on technologies with lead times mapped to the vendor and/or internal product roadmaps for when things will no longer be supported. In a lifecycle management approach, everything is scheduled, predicted, and planned. This allows you to anticipate issues and minimize interruptions. By having an understanding of the benefits that a complete end-to-end solution can provide, CIOs, CFO’s and chief security officers (CSO’s) will be better able to address the issues they are facing within their particular organization. This ecosystem of connected and interdependent resources must be managed to ensure everything runs smoothly and is kept up-to-date, which can be a daunting task. From a cybersecurity perspective, unpatched technology can leave your network vulnerable to a cyber-attack. However, old and outdated technology can pose other threats to your business as well. Following lifecycle management practices – knowing where your risk areas are, and keeping current on those risks – allows you to keep your business more secure. What are the risks of an unoptimized Technology Lifecycle? Loss of Business Opportunities: When your business processes are not adaptable and flexible, you lose the ability to move with the market, technologies, and your customers. Having significant elements of your business processes locked and attached to systems and dependencies you cannot control leaves you locked out of opportunities. You lose business when you have business processes that are dependent on things you can no longer control. Failed Business Processes: What does a failure do to your organization? It affects your revenue and reputation. Plus it changes the focus of the company. Instead of taking care of business, everyone is distracted to only deal with the failure. Unplanned Costs: If you experience a failure, solutions to get you back online can be extremely expensive. Costs are typically much higher when running in crisis/emergency response mode than as part of a business plan. For example, you have an appliance that handles your web proxy that always runs smoothly and gets automated updates from the vendor without issue. Unfortunately, no one paid attention to the announcement from the vendor that it would no longer be supported after a certain date. The date comes and goes, and then a year later the appliance stops working. Now you need to purchase a new appliance unexpectedly, plus pay extra to get it installed in a day. 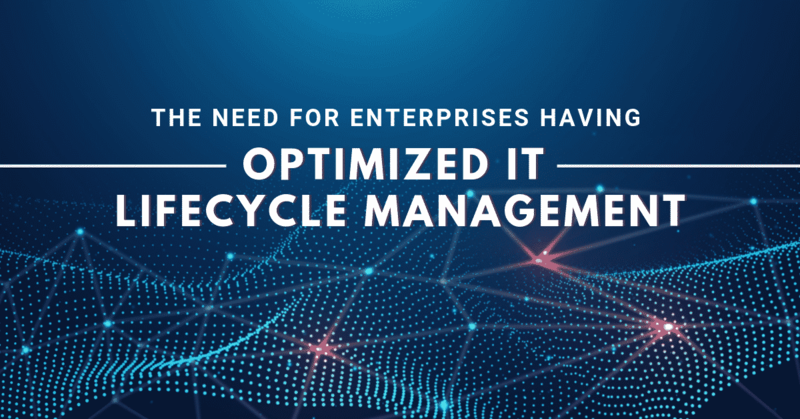 Using an optimized lifecycle management practice allows you to be aware of what is critical in your environment and helps your company to avoid these costs. Banish / Lose Customers: The experience of an outage of your entire business or a single business process could be critical. Doesn’t matter how long it takes. Where does that leave your customers? Imagine the connector to your payment processor fails because of an outdated piece of hardware. The inability to process payments would not be acceptable to customers, and will most likely have them looking to do business elsewhere. What to do? Asignet has the most advanced IT Lifecycle Management solutions with an aPaaS platform, patented technology, and managed services.